The cover art of the debut album, Rumble, recorded at Cargo in 1984, was their simplest to date and showed only the same drawing of a shot corpse that first appeared on the back cover of ‘The Interior’ and had gone on to feature on most of the band’s subsequent artwork (with the addition of a sheriff’s badge). More Stafford doodles adorned the back cover with the accompanying inner sleeve featuring duotone photos of the band on one side and Stafford’s handwritten lyrics on the other, ghastly spelling and all. It had been barely fourteen months since the partly formed Babies had first entered the studios to throw down their first recordings and over that period of intense activity they had released four singles and completed their first long player. The quality of Rumble was a just reward for those months of hard work and it is a mightily impressive debut album, nicely produced, keenly performed and sounding huge. From the pounding bass introduction to ‘She Mercenary’ to the conclusion of the brooding, untitled final track, Rumble maintains an impressive mood of menace and intent which isn’t shaken by the inclusion of the earlier singles ‘The Interior’ and ‘Big Jugular’ despite their rawer and less replete sound. (‘Grunt Cadillac Hotel’ was probably omitted because of its thinness.) What makes Rumble stand out above all things is the restraint. Missing are the breakneck tumbling adventures of some of the earlier songs and these are replaced by controlled and measured bursts of nastiness which all add to the pressure cooker environment. Of course, this leaves Mike Keeble with less room to flay about in and his vocals occasionally come across as a little understated; even when the band take off, as on ‘Grease-Ball Mechanic’ the singer lets eveything fly past him, but ultimately it all works for good. Rumble sounds a complete record, interwoven and purposeful and a stunning reminder of how good things used to be. Harry: I was so pleased with this record that I couldn’t bring myself to listen to it for a month in case it wasn’t as good as I thought it was. It really caught the right mood and energy we had, not to mention days and days in our rehearsal room practising to be as solid and as sharp as a jockey’s prick. The Review in Sounds gave us 5 stars and said, “From Elvis to the Ramones to the Incas the story of Rock and Roll is complete”. Well, in 1984 anything was possible. We had some fun putting it all together and it got us a load of gigs all around Europe; we nearly got on to Rough Trade’s Touring Agency but they changed their minds at the last minute when their American partners told them not to book any more “English haircut bands”. This was at the end of New Romanticism and I think they might have confused us with A Flock of Seagulls or Kajagoogoo. But no fear, we had a number 2 album (indie charts) with this, just behind Meat is Murder which we just couldn’t shift from the top spot – probably because they sold ten times more records. Interestingly, the track ‘Cactus Mouth Informer’ inspired someone to put up a blog site in 2006, so we were remembered for that. It’s a small site so I don’t think I should really ask for royalties. Five Stars. 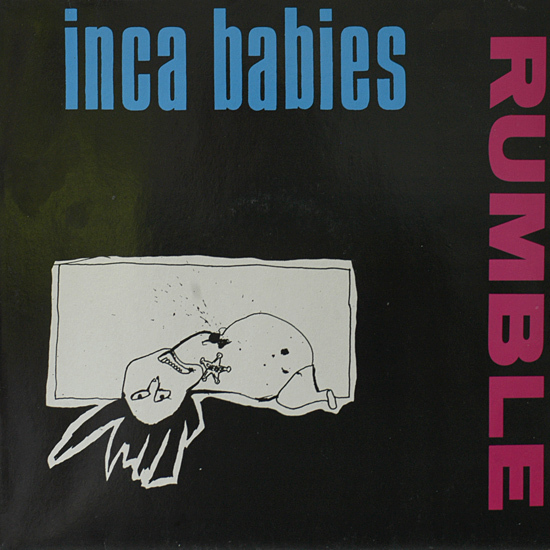 Read musch more here: Inca Babies Discography.